1. Tigers vs. Orioles. These teams are mirrors of each other. Baltimore hits home runs, plays great defense, and has a stellar bullpen. Detroit has the THE STAR and the starters. This is going to be the ultimate test of postseason theories: do you need strong starting, defense, bullpen, or home runs to win? Prediction: Tigers in 4. The Tigers will not win the world series with that bullpen (we’ve heard this story before), but they have more than enough to get past an Orioles team that lacks dominant starting pitchers. 2. Angels vs. Royals. The Angels have the best record and offense in baseball. The Royals bunt and steal all the time and have the best bullpen in the postseason. Will this be bedlam in KC or Mike Trout’s national coming-out-party? Prediction: I want to pick the Royals so badly. I really, really do. Oh, I want to pick them. In fact, a couple of months ago when I was sketching things out, I thought they might have the best path to the World Series in the American League. That, though, was based on them winning the division, which they did not do. Furthermore, that game against the A’s revealed just how clueless Ned Yost can be. Sometimes, and it is rare, a manager can help win a series, usually they are fairly neutral, and there are some times where they are an all-out liability, and I fear that is where Yost is. Yikes. Angels in 4. 3. Dodgers vs. Cardinals. Of course they are playing each other, which means, if the Giants get through they will have to play their long-standing mortal enemies (the Dodgers, just in case you didn’t know), or the team Giants’ fans have learned to hate in recent years (the Cardinals, mostly for being the Cardinals). And even if the Giants don’t make it through it means one of these teams will play the Nationals (who we will then hate) in an absolutely awful NLCS. This is the most detestable of all possible matchups. Prediction: Mattingly is horrible, the bullpen is shaky, and the non-Kershaw/Greinke starters are a major liability. Plus Puig will do something stupid at some point. Otherwise the Dodgers are basically unbeatable. The Cardinals had a surprisingly bad offensive season, some shakiness in the rotation (that seems to have been shored up), and are here mainly because the Brewers faded so badly. And yet, they are the Cardinals, the team, other than the Giants, most likely to play flawlessly in October. I won’t be the least bit surprised if the Cardinals win this series, but I’m going with the Dodgers in 5. 4. Giants vs. Nationals. The Nationals are the best team, in my opinion, top to bottom in this tournament. So, of course, the Giants get them in a short series. Awesome. That being said, the only result here that would be shocking to me is a sweep by either team. Mostly, though I just don’t see the Giants laying down. It’s going to go 5 either way. I’ll have a bigger preview tomorrow morning, but for now a couple of silver linings for the Giants: the Nationals have a lot of right-handed starting pitching. They are really good, so that part stinks, but the right-handedness plays into the hands of a lineup that is heavy lefty right now. Second silver lining: Matt Williams is a rookie manager, and only 4 times has a rookie manager won a World Series. The last one to do it, of course, was another ex-Giant, Bob Brenly, whose team won in spite of him, not because of him. Loved Matt Williams as a third baseball in the black and orange, but he might be a liability. Prediction: The Nationals are too deep to go down to a Giants team lacking Angel Pagan, Michael Morse, and Matt Cain. Nationals in 5. I should admit upfront that I am a bit of an Albert Pujols fanboy. Maybe it’s because we are the same “age”. Maybe it’s because I’ve never lost a fantasy baseball league where I had him on my team. Maybe it’s because I called that moon shot he hit off Brad Lidge in the playoffs a few years back. I don’t know. But he has been my favorite non-Giants/non-Red Sox player for years now. Since I’ve moved to Boston I have actually met a number of people from the midwest. Far more than I ever knew in California. Which means I’ve met some Cardinals fans. The response to Pujols-to-the-Angels has been somewhat surprising. A little sadness but a whole lot of relief. As in, “I’m so glad we didn’t forfeit our future just to keep El Hombre around.” And I understand that…Cardinals fans look at Pujols and see the next A-Rod, but know the team has much less ability to absorb a bad contract when compared to the Yankees. They knew keeping Pujols meant seeing a lot of good young talent walk away over the next ten years. I get it. Because Pujols. Now, I’m sure they have not been sitting around for the past 3-4 years with a plan to grab Albert when he hit the market, but he did, and because they had passed on some of these other guys they were ready for it. seriously, who would you rather have for the next 7 years? Carl Crawford, Mark Texeria, Alex Rodriguez, or Albert Pujols? No brainer. Because here’s the deal. Pujols is a once of a lifetime opportunity. My apologies to the Prince Fielder’s of the world, but this guy is the best player of this free agent class, of the past 5 years, and of this generation. He will slow down a bit, but barring a catastrophic injury, Pujols is going to hit 700 home runs. He is going to be a force at age 40. He is going to guarantee they have a good offense every year for the next 10 years. There are not enough superlatives. Now, I am not as cynical as I once was, and so if the Giants don’t win the 2010 WS I probably don’t look back on the Bonds’ years the same way, but I’ve lived the reality of having a once-a-generation player as the heart of the team. The Giants had a chance in 1993, ’97, ’98, 2000, ’01, ’02, ’03, and ’04. Yes, it didn’t happen to any of those teams, but as we all know, it could have. How are the 2010 Giants really all that better than the 2000, or the 2002 versions? Pujols himself has won two rings with teams no one thought had a chance, and has lost with teams that were juggernauts (2004, 2005). 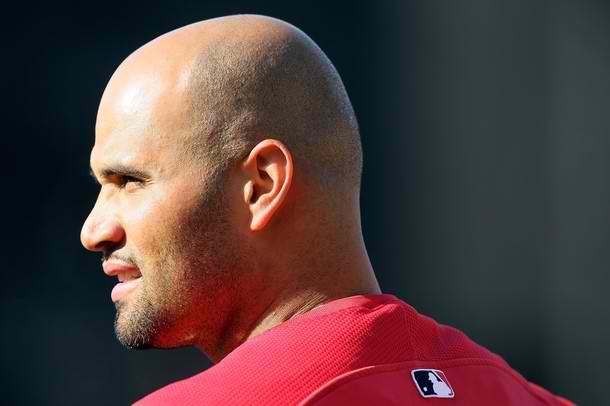 Bottom Line: when a player like Pujols comes along, you go all in and you see what happens. No guarantees, but the Angels will be competitive, interesting, and relevant for a decade. Done. So, while I get all the arguments for letting him go, I don’t fault the Angels for opening the bank vault and rolling out the red carpet. It’ll be interesting to see how we think about this 10 years from now, but I can tell you this, having lived through Bonds, you WILL enjoy every minute of it Angels fans. You will. Earlier in the year I wrote a series of articles that attempted to show the best indicator that a team would win the World Series was a spike in a pitching proficiency. (You can read those articles here, here, and here). My point was, and is (especially in Part 2), a good team sees a measurable jump in the quality of their pitching, leading to a championship. This jump can come from importing talent, seeing its own pitchers improve, or from the emergence of a young arm or two over the course of the season. Due to injuries, fatigue, or simply the inability to add more quality arms no team has been able to produce back-to-back championships in a decade marked by parity, the eradication of PEDs, and the rise of young talented players (especially pitchers). Interesting. Oakland is surprising (that they are that high, not that they are good), as are the Yankees and Colorado. Texas is 12th, the White Sox 13th, Boston 14th, Tampa Bay 16th, after Tampa everyone is considered below league average. That includes such contenders as Arizona (17), Cleveland (18), Milwaukee (20), the Reds (22), St. Louis (25), and, very surprisingly, Detroit at 26th. That certainly profiles like a team on the Championship march. We’ll skip the A’s since they are quite out of it at this point (demonstrating that you do need offense to win games in MLB). Again, all excellent improvements for the Braves making them a serious contender. Not that we didn’t know that all ready but both these NL East teams fit the profile to a T.
The Yankees are interesting. They certainly have seen improvement, but how lucky has it been? How long can Colon and Garcia and the rest keep this up? Their BABIP is right in line with the league average, but something tells me they are in for a correction (see last night vs. the Blue Jays). Bottom line: the Giants are still nasty. One thing that is interesting to me is that it appears they’ve cut down a bit on the walks/baserunners. Anecdotally that doesn’t seem true (thank you Jonathan Sanchez) but there you go. It’s not a dramatic improvement, but they didn’t need one (and keep in mind they didn’t actually improve dramatically last year either…this is a three-year run of greatness). Another team that fits the profile well. Interesting that their team strikeout rate is down (their best pitcher, Jered Weaver, is up). The Angels are going to be tough the rest of the way. I’m going to skip Seattle, San Diego, and Colorado since none of those teams are in serious contention right now (although I might regret that decision later in the month). How about that for a dramatic improvement…from well below average to nicely above. There are a few things to worry about here: they still don’t strikeout a ton of guys and they give up too many baserunners. They have solid defense and guys that keep the ball on the ground (less than one HR per 9 innings). But, I wonder how this will hold up over the last two and a half months. That’s it for now. Next post I’ll look at some of the other division leaders/contenders to see who else has improved, but for now it seems like everyone is chasing the Phils and the Braves. This ended up being a lot longer than expected so we’re going to do a three parter. The premise of part 2: winning a world series is all about pitching. It takes a big jump in pitching production from the year before to win the championship and in the last ten years that jump has been unsustainable for reasons I will try to explain in part 3. I recently reread Baseball Behind the Numbers by the Baseball Prospectus guys. Having just watched the Giants surprising postseason run I was eager to review the study where they unveil the factors that lead most directly to success in the postseason. According to BP, the only four factors that have any kind of statistical significance (and it’s not that much statistically speaking) are: 1) strong starting pitching (and more specifically, power pitchers who can strike batters out and get swings and misses), 2) dominant relief pitching (especially from the closer), 3) defense that doesn’t make mistakes (doesn’t have to be great in terms of range but NO errors), 4) to a much lesser extent than the first three, power hitting (i.e. home runs). Winning in the postseason, and thus the World Series, is, based on the stats, all about pitching. My observation is that over the last ten years the WS champions have seen a major addition or jump forward in their pitching talent, and then an inability to sustain that the next year. I am way more adept at reading statistical baseball analysis than performing it, so what follows is pretty elementary, but hopefully you will see my point. Let’s look at the last 10 World Series Champions, how their pitching fared in the year before, the year of, and the year after their win, and their key staff additions (through trades, free agency, or a young talent emerging). I’ll be using K/9, ERA, ERA+ (note that an era+ score of 100 is league average), and WHIP data from BaseballReference.com. The Diamondbacks had 2 key additions in 2001: a full season of Curt Schilling and Miguel Bautista. They also had some great subtractions (no Omar Daal). They actually had a better regular season in their repeat year, but got swept out of the first round of the playoffs by the Cardinals. Thus begins the trend I hope to highlight here: it is very difficult to get the same production out of a pitching staff two post-seasons in a row. Especially staffs that are super top-heavy (It was Johnson and Schilling and then smoke and mirrors the rest of the way). A classic case of key additions (Kevin Appier which sent Scott Schoenwies to the bullpen) and the emergence of young talent (John Lackey, K-Rod, Scot Shields) providing a huge, but unsustainable, bump in production. The 2002 Angels actually saw a bigger salary increase from 2001 to 2002 than the infamous 1997 Marlins team. As a result, they got better in a lot of areas, not just pitching. In 2004 they saw a similar bump when they added Bartolo Colon and Kelvim Escobar and won the division before getting bounced from the playoffs in dramatic fashion by David Ortiz (I mean the Boston Red Sox). Looking at this makes me mad because it reinforces what a flukey team this was. They were obviously helped by the additions of Donrelle Willis, Matt Redmond, and Uegeth Urbina as well as getting full/emergent seasons from Carl Pavano and Josh Beckett. But they were essentially the same (fairly average) staff all three years with a small spike in performance in 2003. One caveat (and some foreshadowing) injuries really hurt them in 2004 as none of their 5 main starters pitched a full season. The White Sox trump the ’04 Red Sox in my pitching cycle theory. The addition of Orlando Hernandez, healthy/full seasons from Freddy Garcia and Jose Contreras, and the emergence of Jon Garland and Bobby Jenks help partially account for this crazy spike in ERA+ followed by a tremendous drop. The interesting thing about the White Sox is how the K rate stayed the same, but the other numbers changed so dramatically. This probably shows that in ’05 they had an exceptional year defensively and got a bit lucky (if I had more time I’d look into some other numbers like BABIP). The 2005 Chicago White Sox: the poster-children for my pitching theory. If the ’05 White Sox are my well-behaved/front row students, then the ’06 Cardinals are my unruly/spit wad shooting/back row/trouble makers. Thanks for killing the drill guys. That said, keep in mind that the Cards had GREAT teams in 2004 and 2005 and that the ’06 team was basically the same core. Also, you do see a drop in the repeat year, mostly having to do with losing Chris Carpenter for the season (notice a big injury following a Championship has a lot to do with the depressed repeat season stats). However you slice it, this was a weird Championship team, period. The Red Sox stats show that they had the best chance of anyone to repeat in the last 10 years. They went to 7 games against the Rays in the 2008 ALCS and from their statistical steadiness that should be no surprise. The big additions in ’07 were the Japanese imports (Matsuzaka and Okajima), plus Becket had the best year of his career as he fully adjusted to life in the AL East. Papelbon also benefited from his first full season in the closer role. The Sox did add a full season of John Lester in ’08 which helped, but the big problem with repeating was Becket broke down as the season wore on and pitched with half a shoulder in playoffs. Again, the injury problems to key starters in the year after a WS win is a major reason why teams have struggled to repeat. Record wise, the Phillies have gotten better each of the last 4 years (including 2010). And they seem to be the team that takes my theory “most seriously,” having added Cliff Lee in 2009 to try to repeat, Roy Halladay/Oswalt in 2010 to get back on top, and Cliff Lee again this offseason. Hats off for improving the most important part of the team four years running. The 2008 championship team featured the key addition of Brad Lidge (who had the year of his life posting a 226 ERA+) which allowed them to put Brett Myers back in the rotation. 2008 also saw the emergence of Cole Hamels (ERA+ of 142). However, despite the addition of Lee in ’09, Lidge had a major setback that year posting an abysmal ERA+ of 59, and Hamels struggled with mental and physical issues all year (ERA+ of 97). Bullpen struggles have really hampered them the last two seasons. The Yankees are an interesting case. First, it’s clear that their success is more closely tied to offense than any team in the last 10 years. Despite some significant additions over the last three years, they have had essentially the same staff production each season. Each staff had one guy who had a great year (Mike Mussina in 2008…look it up, it was legit…and then CC Sabathia in ’09 and ‘10), one other guy who stepped up as a legitimate number 2 (Andy Pettitte in ’08, AJ Burnett in ’09, Phil Hughes in ‘10). The big difference in 2009 was Pettitte offered a solid third option, which they sorely lacked in 2008 and 2010. 2010 had a lot to do with injuries, per usual, with Pettitte/Javier Vasquez/Burnett all missing time or lacking effectiveness due to being hurt. That’s it for part 2. Sorry for the length! Tomorrow we’ll wrap it up by looking at the 2010 Giants, drawing some conclusions, and deciding if this spells doom or not for 2011 Giants.